MRL/MpJ-Tnfrsf6lpr (MRL/MpJ-Faslpr; MRL-Faslpr) mice develop a spontaneous lupus syndrome closely resembling human systemic lupus erythematosus. To define the role of IL-10 in the regulation of murine lupus, IL-10 gene-deficient (IL-10−/−) MRL-Faslpr (MRL-Faslpr IL-10−/−) mice were generated and their disease phenotype was compared with littermates with one or two copies of an intact IL-10 locus (MRL-Faslpr IL-10+/− and MRL-Faslpr IL-10+/+ mice, respectively). MRL-Faslpr IL-10−/− mice developed severe lupus, with earlier appearance of skin lesions, increased lymphadenopathy, more severe glomerulonephritis, and higher mortality than their IL-10-intact littermate controls. The increased severity of lupus in MRL-Faslpr IL-10−/− mice was closely associated with enhanced IFN-γ production by both CD4+ and CD8+ cells and increased serum concentration of IgG2a anti-dsDNA autoantibodies. The protective effect of IL-10 in this lupus model was further supported by the observation that administration of rIL-10 reduced IgG2a anti-dsDNA autoantibody production in wild-type MRL-Faslpr animals. In summary, our results provide evidence that IL-10 can down-modulate murine lupus through inhibition of pathogenic Th1 cytokine responses. Modulation of the level of IL-10 may be of potential therapeutic benefit for human lupus. MRL/MpJ-Tnfrsf6lpr (MRL/MpJ-Faslpr; MRL-Faslpr) mice develop a severe autoimmune disease closely resembling human systemic lupus erythematosus (SLE),3 with hypergammaglobulinemia, autoantibodies, immune complex glomerulonephritis, and lymphadenopathy (1). CD4+ αβ T cells are required for full penetrance of disease in MRL and other murine models of lupus, largely via their help to autoreactive B cells (2, 3, 4). A predominant Th1 cytokine response is associated with the pathogenesis of lupus in both humans and mice. Increased IFN-γ mRNA and decreased IL-4 gene expression are found in PBMCs taken from SLE patients (5). Th1 cytokines, including IFN-γ, are present in tissue of SLE patients with the most severe disease, with enhanced production of this cytokine by peripheral blood cells and in the kidneys of patients with severe lupus glomerulonephritis, compared with individuals with milder renal disease (6, 7). Likewise, in mice with lupus, Th1 cytokines play a dominant role in disease pathogenesis (8). For example, disease severity in MRL-Faslpr mice is linked to the presence of the Th1 cytokines IFN-γ (9, 10, 11, 12) and IL-12 (11). IFN-γ gene deficiency (9, 12) or IFN-γR deletion (10) in these animals dramatically reduces glomerulonephritis, apparently through reduced production of IgG2a (an Ig isotype associated with the Th1 phenotype) anti-dsDNA Abs. Similarly, IFN-γR deletion prevents autoantibody production and glomerulonephritis in lupus-prone (NZB × NZW)F1 mice (13). Transgenic expression of IFN-γ in the epidermis of nonautoimmune mice leads to the development of inflammatory skin disease resembling lupus erythematosus, with 30% of female mice also developing severe immune complex-mediated glomerulonephritis (14, 15). Expression of an IFN-γR Fc fusion protein by i.m. injection of a plasmid containing its cDNA can retard lupus development and disease progression in MRL-Faslpr mice (16). Consistent with these observations is the finding that retroviral-induced IL-12 expression in the kidney elicits autoimmune injury by fostering the accumulation of IFN-γ-secreting T cells within this organ (11). IL-10 is a regulatory cytokine that inhibits Th1 cytokine production and proliferation of CD4+ T cells via its indirect effects on APC function or through direct effects on T cells (17). This cytokine has been presumed to be an important modulator of disease activity in human SLE. Patients with lupus produce large amounts of IL-10 (18), with enhanced gene expression in PBMCs (5), and its serum level correlates with disease activity (19, 20, 21). While the precise role of IL-10 in the pathogenesis of lupus remains uncertain, studies have suggested that this cytokine is pathogenic both in humans and in mice with disease. For example, continuous administration of anti-IL-10 delays onset of autoimmunity in (NZW × NZB)F1 mice, an effect perhaps mediated by up-regulation of TNF-α production (22). Moreover, it has been recently reported that anti-IL-10 administration to six human lupus patients with active disease, and dependent upon steroids for treatment, led to a reduction in disease activity (23). Despite the evidence suggesting that IL-10 might promote disease in lupus, we hypothesized that it might also play a suppressive role, given its effects on T cell expansion and its potential to modulate potentially pathogenic Th1 responses. To address this hypothesis, we produced and analyzed MRL-Faslpr mice genetically deficient in this cytokine. Compared with wild-type MRL-Faslpr mice, animals deficient in IL-10 developed exacerbated disease, with earlier appearance of skin lesions, increased lymphadenopathy, more severe glomerulonephritis, and earlier and enhanced mortality. These findings were associated with enhanced production of the Th1 cytokine IFN-γ by CD4+ T cells and by CD8+ T cells, along with greater synthesis of potentially pathogenic IgG2a anti-dsDNA Abs. The latter were increased in IL-10-deficient mice early in disease, a finding mirrored by the administration of IL-10 to wild-type MRL-Faslpr mice with resultant suppression of these Abs, again early in disease. These findings suggest that IL-10 regulates murine lupus, particularly early in the disease course, and that its effect is at least in part mediated by suppressing pathogenic Th1 responses. B6.129.P2-Il10tm1Cgn (C57BL/6-Il10tm1Cgn, B6 IL-10−/−) mice obtained from The Jackson Laboratory (Bar Harbor, ME) were backcrossed to the MRL-Faslpr background for 10 generations (N10; >99.9% MRL background genes) to obtain MRL-Faslpr IL-10+/− mice, which were then intercrossed to generate three groups of animals: IL-10 intact (IL-10+/+), IL-10 heterozygous (IL-10+/−), and IL-10 deficient (IL-10−/−). Genotypes were determined by PCR screening of tail DNA according to a protocol from The Jackson Laboratory and were confirmed at time of sacrifice: LPS-stimulated splenocytes lacked IL-10 synthesis as determined by intracellular staining after brefeldin A blockade (see Intracellular cytokine staining). B6 IL-10−/− mice were also crossed twice with B6.MRL-Tnfrsf6lpr (B6.MRL-Faslpr, B6-Faslpr; The Jackson Laboratory) to obtain control B6-Faslpr IL-10−/− mice. All animals were maintained under specific pathogen-free conditions at the Yale University School of Medicine (New Haven, CT). Wild-type MRL-Faslpr mice (6 wk old) were administered rIL-10 (a kind gift from Schering-Plough Research Institute, Kenilworth, NJ) in PBS (200 ng/mouse/day for 6 days, n = 20 mice) via i.p. injection, or, as a control, were given PBS alone (n = 12 mice). Mice were bled by retroorbital puncture under anesthesia before the initiation of IL-10 or control injections, and again at ages of 10 and 14 wk, and just before the mice were sacrificed at age 17 wk. Sera were stored at −20°C until assays were performed for autoantibodies and their isotypes as described below. Serum anti-dsDNA IgG Abs were measured by ELISA using S1 nuclease-treated DNA linked to plastic wells by methylated BSA as described previously (9, 24). Simply, methylated BSA in carbonate buffer (pH = 9.6) was coated on ELISA plates (Costar, Cambridge, MA) at room temperature, followed by overnight coating with dsDNA at 4°C. Mouse sera were diluted 1/100 in 3% FBS in PBS and incubated at 37°C for 2 h, with the bound IgG detected with HRP-conjugated anti-mouse IgG (Sigma-Aldrich, St. Louis, MO). After adding the tetramethylbenzidine peroxidase substrate and sequential stop solution (Kirkegaard & Perry Laboratories, Gaithersburg, MD), the plates were read in an ELISA reader at wavelength of 450 nm. For analysis of anti-dsDNA IgG isotypes, after incubating the mouse serum as above, biotin-labeled anti-mouse IgG1, IgG2a, IgG2b, and IgG3 (BD PharMingen, San Diego, CA) were added at a dilution of 1/2000 to the plates at 37°C for 1 h, followed with streptavidin-HRP. Plates were then developed and measured by using tetramethylbenzidine substrate as above. A positive serum sample from a 5-mo-old wild-type MRL-Faslpr mouse was used as an internal control in all assays. The reaction was stopped according to the OD value of the standard serum in all assays to assure day to day consistency. Serum urea nitrogen levels were performed by the Clinical Chemistry Laboratory of Yale New Haven Hospital. To assess T cell cytokine production, splenocytes (2 × 106/ml) were activated with anti-CD3 and anti-CD28 in the presence of brefeldin A for 6 h, and cells were washed, fixed, permeabilized, and stained with FITC-anti-IFN-γ and PE-anti-IL-4 or PE-anti-IL-10 (see genotypic analysis of cohorts above) as described (25). Meanwhile, cells were stained with CyChrome-anti-CD4 or anti-CD8 and biotin-B220 followed with avidin-allophycocyanin. After gating on CD4+B220− or CD8+B220− cells (Fig. 6⇓B), data were displayed as dot plot of FITC (x-axis) and PE (y-axis) fluorescence (log scale). Quadrant markers were positioned to include >99% of control Ig-stained cells in the lower left quadrant (data not shown). Spleen and cervical lymph nodes (LN) were weighed, homogenized, and cleared of erythrocytes by Red Blood Cell Lysing Buffer (Sigma-Aldrich). Phenotypic analysis was performed by using four-color FACS analysis (FACSCalibur; BD Biosciences, San Jose, CA) using the following Abs: biotinylated anti-mouse CD45R/B220 (RA3-6B2, rat IgG2a) followed by avidin-allophycocyanin, FITC anti-mouse CD3ε (145-2C11, hamster IgG), PE or CyChrome anti-mouse CD4 (H129.19, rat IgG2a), and CyChrome anti-mouse CD8 (53-6.7, rat IgG2a), all purchased from BD PharMingen. Cells were labeled with FITC anti-CD3, PE anti-CD4, CyChrome anti-CD8, and biotin-B220 followed by avidin-allophycocyanin. After gating on CD3+B220+ or CD3+B220− cells, CD4+ and CD8+ cells were then analyzed. Renal disease and skin lesions were assessed by light microscopy as described (9, 24). Briefly, formalin-fixed tissues (kidney or skin) were stained with H&E. Individual kidney specimens were read blindly by Dr. M. Madaio (University of Pennsylvania School of Medicine, Philadelphia, PA) and scored on a scale of 0 to >4+ as described in detail previously (26, 27, 28). Skin samples were read blindly by Dr. J. McNiff (Department of Dermatology, Yale University). Statistical significance was evaluated by two-tailed, unpaired Student’s t test or nonparametric analysis if SD were significantly different between the two compared groups, using software InStat 2.03 for Macintosh (GraphPad, San Diego, CA). Survival curves and analysis of the penetrance of skin lesions were determined using log rank test, performed by GraphPad Prism Version 3.0a for Macintosh (GraphPad). Throughout the text and figures, the following terminology was used to denote statistical significance: ∗, p < 0.0001 or p < 0.001; ∗∗, p < 0.01; ∗∗∗, p < 0.05. We initially asked whether the genetic absence of IL-10 affected mortality of MRL-Faslpr mice. In this study, three groups of animals, all housed together in the same room and followed for up to 17 wk of age, were analyzed: MRL-Faslpr IL-10+/+ (n = 13), MRL-Faslpr IL-10+/− (n = 24), and MRL-Faslpr IL-10−/− (n = 10). Notably, MRL-Faslpr IL-10−/− mice demonstrated substantially increased mortality compared with their IL-10+/+ or IL-10+/− counterparts: the survival rate for MRL-Faslpr IL-10−/− mice was only 50% at 17 wk of age (5 of 10 mice survived until this time point), with death beginning as early as 12 wk, compared with a 100% survival rate in MRL-Faslpr IL-10+/+ animals and a 90% survival rate in the MRL-Faslpr IL-10+/− group (Fig. 1⇓; p < 0.0001, survival of MRL-Faslpr IL-10−/− mice compared with either the IL-10+/− and IL-10+/+ groups). By contrast, none of the cohort of B6-Faslpr IL-10−/− mice died by age 28 wk (n = 6; data not shown). These results suggest that IL-10 plays an important role in down-modulation of disease in MRL-Faslpr mice. Enhanced early mortality in IL-10-deficient MRL-Faslpr animals compared with IL-10-sufficient controls. Three groups of animals, all housed together in the same room and followed for up to 17 wk of age, were analyzed: MRL-Faslpr IL-10+/+ (n = 13), MRL-Faslpr IL-10+/− (n = 24), and MRL-Faslpr IL-10−/− (n = 10). The survival rate was recorded weekly until mice were sacrificed at age 17 wk. Animals deficient in IL-10 had a significantly enhanced mortality compared with IL-10-sufficient mice (∗, p < 0.0001 for IL-10−/− compared with either IL-10+/+ or IL-10+/− animals, as determined by log rank test). To define the effects of IL-10 deficiency upon end-organ autoimmune disease, and to attempt to ascertain the cause of accelerated mortality in the MRL-Faslpr IL-10−/− group, we evaluated kidneys at 17 wk of age from a second cohort of 23 animals: MRL-Faslpr IL-10+/+ (n = 6), MRL-Faslpr IL-10+/− (n = 11), and MRL-Faslpr IL-10−/− (n = 6). We also assessed renal disease in mice from the first cohort, described above in the mortality curves, that survived to 17 wk of age: MRL-Faslpr IL-10+/+ (n = 5, randomly selected of the 13 animals), MRL-Faslpr IL-10+/− (n = 11, randomly selected of the 21 survivors), and MRL-Faslpr IL-10−/− (n = 4). Kidney specimens were blindly evaluated by light microscopy and scored on a scale of 0 to >4+ as described in detail previously (26, 27). MRL-Faslpr IL-10−/− mice consistently developed more severe disease than IL-10+/+ animals with significantly enhanced glomerulonephritis (Fig. 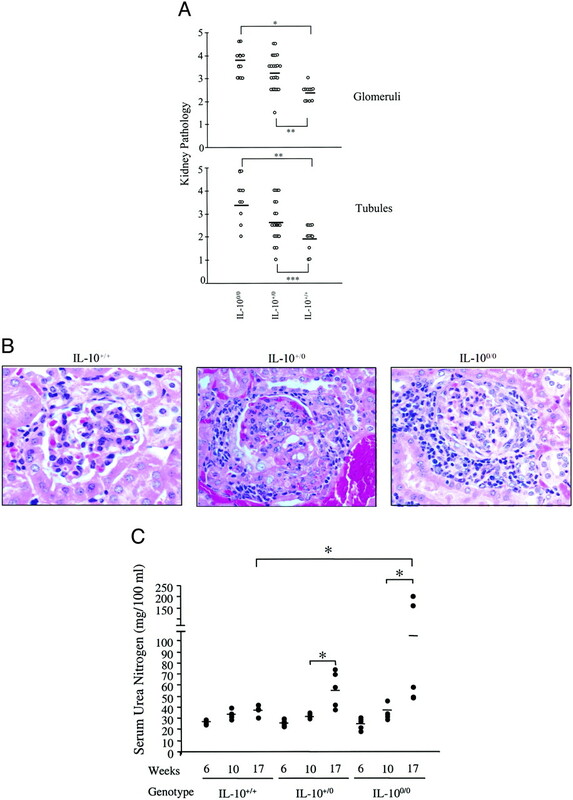 2⇓A, upper panel, mean score 3.7 in IL-10−/− mice vs 2.4 in IL-10+/+ animals, p < 0.001) and interstitial nephritis with large multifocal infiltrates (Fig. 2⇓A, lower panel, mean score 3.35 for IL-10−/− mice vs 1.95 for IL-10+/+ animals, p = 0.0074; see examples in Fig. 2⇓B). Although IL-10+/− mice had significantly worse glomerulonephritis (p < 0.01) and interstitial nephritis than wild-type mice (p < 0.05) and less severe disease than IL-10−/− animals, the comparison to the latter group did not reach statistical significance (Fig. 2⇓A). Of note, kidney abnormalities were not observed in B6-Faslpr IL-10−/− mice when they were sacrificed at 28 wk of age (n = 6, data not shown). IL-10-deficient MRL-Faslpr mice develop more intense glomerulonephritis than IL-10-sufficient controls. Renal tissue from three groups of mice was formalin-fixed and stained with H&E: MRL-Faslpr IL-10+/+ (n = 11; 5 from the first cohort and 6 from the second), MRL-Faslpr IL-10+/− (n = 22; 11 from each cohort), and MRL-Faslpr IL-10−/− (n = 10; 4 from the first and 6 from the second cohort). Kidney specimens were blindly evaluated by light microscopy and scored on a scale of 0 to >4+ as described in detail previously (26 ,27 ,28 ). A, Scores of glomerulonephritis (upper panel) and interstitial nephritis (lower panel) are shown, with average scores denoted by horizontal bars. MRL-Faslpr IL-10−/− mice had significantly worse renal histology than MRL-Faslpr IL-10+/+ animals, with the latter mice having less significant disease than the MRL-Faslpr IL-10+/− group (∗, p < 0.0001; ∗∗, p < 0.01; ∗∗∗, p < 0.05). B, Examples of kidney pathology from each group are shown. C, Urea nitrogen concentrations in the sera of the three groups of mice (ages 6, 10, and 17 wk) are shown. To assess renal function, serum urea nitrogen levels were measured in five random samples from each group of mice, from both cohorts of animals. At the age of 10 wk, urea nitrogen levels were significantly higher in all three groups in comparison to mice at 6 wk of age. After 10 wk of age, only the IL-10−/− and IL-10+/− mice showed significantly progressive renal insufficiency (Fig. 2⇑C). Moreover, at age 17 wk, urea nitrogen levels were significantly higher in IL-10−/− mice than in IL-10+/+ mice. MRL-Faslpr mice typically develop skin lesions of back, neck, and ears by age 5–6 mo (29, 30). To determine whether IL-10 is associated with the development of the skin lesions that characterize MRL-Faslpr mice, we also blindly analyzed our initial cohort of 47 mice, described in the mortality assessment in Fig. 1⇑, for skin involvement. MRL-Faslpr IL-10−/− mice had skin lesions at an earlier age, compared with the IL-10+/+ or IL-10+/− controls. By age 13 wk, 50% of IL-10−/− MRL-Faslpr mice developed skin lesions, with 80% penetrance of these manifestations by 14 wk of age, in comparison to 25% penetrance in the IL-10+/− group and in comparison to the absence of skin lesions in IL-10+/+ mice (Fig. 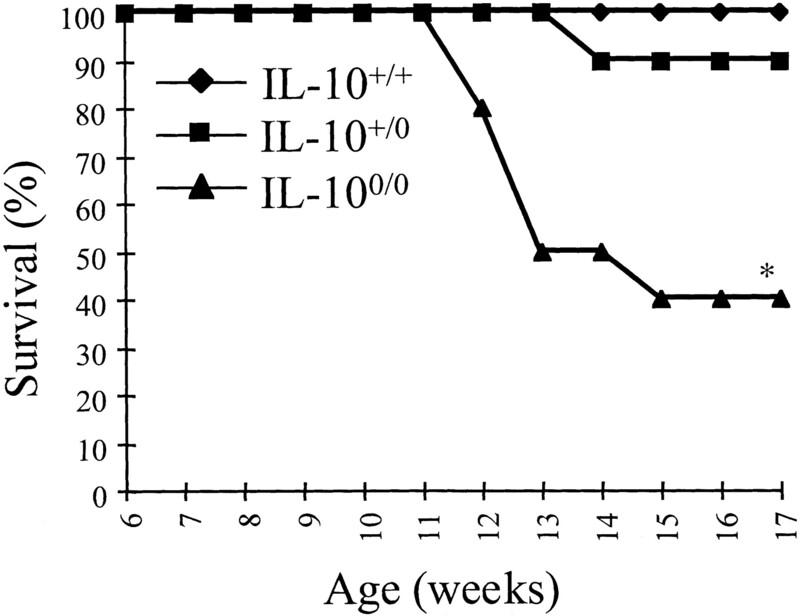 3⇓A, p < 0.01 for IL-10−/− compared with IL-10+/+ and IL-10+/− mice at 13 wk of age and compared with IL-10+/− mice at 14 wk of age, and p < 0.0001 for IL-10−/− compared with IL-10+/+ mice at 14 wk of age; see representative examples in Fig. 3⇓B). At age 16 wk, only 30% of the IL-10+/+ cohort had skin lesions, although 60% of these mice developed skin lesions at 17 wk of age (Fig. 3⇓A). Overall, IL-10−/− mice had a significantly higher penetrance of skin lesions in comparison to both IL-10+/− and IL-10+/+ mice, and IL-10+/− had more such lesions than the IL-10+/+ group (p < 0.05 for both comparisons, log rank test). Skin lesions were absent in the B6-Faslpr 10−/− controls at age 28 wk (data not shown). IL-10 suppresses skin lesions in MRL-Faslpr mice. The initial cohort of 47 mice, described in the mortality assessment in Fig. 1⇑, were observed for skin involvement. Skin lesions were recorded weekly until animals were sacrificed at age 17 wk. A, The percentages of mice that had visible skin lesions are shown, with IL-10−/− mice having significantly earlier onset of skin lesions than IL-10-sufficient controls (∗, p < 0.0001; ∗∗, p < 0.01). B, Examples of skin lesions from each group are shown from mice at 17 wk of age. C, Examples of skin histopathology (H&E staining) from each group are shown from mice at 17 wk of age. To further evaluate skin disease in our cohort, samples were blindly evaluated by light microscopy (see representative examples in Fig. 3⇑C). In both IL-10−/− and IL-10+/− tissues, there was marked epidermal hyperplasia, hyperkeratosis, and interface change of both epidermis and hair follicles consisting of basal cell degeneration and necrotic keratinocytes. There was also mononuclear infiltration in the dermis with dermal fibrosis. These changes are characteristic of lupus erythematosus in the skin of the mouse (30). In contrast, histological analysis of skin of IL-10+/+ mice was normal, with samples revealing a thin two- to three-cell layer epidermis, delicate keratin layer, and no inflammation in the dermis. Sera from the initial, larger cohort of 47 mice at ages 6, 10, 14, and 17 wk (terminal bleed at sacrifice) were analyzed for anti-dsDNA IgG and IgG isotype levels. At the age of 10 wk, the mean level of total anti-dsDNA IgG was significantly higher in sera of IL-10−/− MRL-Faslpr animals than in the IL-10+/+ group (p < 0.01), with sera from the IL-10+/− mice containing levels between the IL-10−/− and IL-10+/+ groups (Fig. 4⇓A). Upon further analysis of the IgG anti-dsDNA isotypes in sera of mice of the same age (10 wk), significant differences in the levels of IgG2a and IgG2b were found between the IL-10−/− and IL-10+/+ animals (Fig. 4⇓B, p < 0.05). Levels of these isotypes in the IL-10+/− cohort were intermediate between the levels in IL-10−/− and IL-10+/+ animals, although these differences were not statistically significant. Levels of IgG1 and IgG3 anti-dsDNA Abs in sera were not statistically different among all three groups of mice. Notably, total IgG anti-dsDNA and anti-dsDNA IgG isotypes also were not significantly different among the three groups of animals at 14 and 17 wk of age (Fig. 4⇓A and data not shown). Here, we cannot exclude the possibility that these latter results at later time points might be affected by death of sickest animals. IL-10 inhibits early production of pathogenic IgG2a and IgG2b autoantibodies. Sera from three groups of mice were analyzed for total IgG anti-dsDNA or IgG isotypes of anti-dsDNA, as described in Materials and Methods: MRL-Faslpr IL-10+/+ (n = 22; 13 from the first cohort and 9 from the second), MRL-Faslpr IL-10+/− (n = 36; 24 and 12, respectively, from each cohort), and MRL-Faslpr IL-10−/− (n = 16; 10 and 6, respectively, from each cohort). A, Sera were analyzed for total anti-dsDNA IgG from 10-wk-old mice, with IL-10−/− mice having significantly greater total IgG anti-dsDNA Ab levels than IL-10+/+ mice (∗∗, p < 0.01). B, Sera were analyzed for different IgG isotypes of anti-dsDNA autoantibodies, with IL-10−/− mice having significantly greater IgG2a and IgG2b anti-dsDNA Ab levels than IL-10+/+ mice (∗∗∗, p < 0.05). C, Sera from 10-wk-old IL-10-treated mice were analyzed for IgG anti-dsDNA isotypes, with treated animals having significantly less IgG2a than PBS-treated controls (∗∗∗, p < 0.05). To further confirm the effects of IL-10 on anti-dsDNA Ab production, rIL-10 was administered daily for 6 days (200 ng/day/mouse) to 6-wk-old wild-type MRL-Faslpr mice, as described in Materials and Methods, with serum collected at ages 6, 10, 14, and 17 wk. Consistent with the data from IL-10−/− mice, 10-wk-old wild-type MRL-Faslpr animals given rIL-10 had significantly decreased levels of IgG2a anti-dsDNA Abs, compared with the group treated with PBS alone (Fig. 4⇑C, p < 0.05); however, effects on IgG2a anti-dsDNA, or effects on other isotypes, were not observed at ages 14 or 17 wk, again analogous to the finding in the mice genetically deficient in IL-10 compared with controls. This observation supports the notion that IL-10 may down-modulate the relatively early production of potentially pathogenic IgG2a autoantibodies; however, the effects of administration of recombinant cytokine are not prolonged. Moreover, we did not identify any significant improvement of renal pathology in the IL-10 treatment group in comparison to control mice (data not shown). While we do not know the reasons for this finding, it is possible that it reflects the timing, duration, or amount of IL-10 treatment. Wild-type MRL-Faslpr mice, like other murine models of lupus, develop Th1 cytokine deviation (8, 9, 10, 12, 13). The former mice also develop lymphadenopathy and splenomegaly, phenotypes largely the consequence of accumulation of so-called double negative T cells that have down-regulated their coreceptors, primarily CD8, and up-regulated B220, with a resultant cell surface phenotype that is TCRαβ+CD3+CD4−CD8−B220+ (31) compared with conventional CD3+D4+B220− or CD3+CD8+B220− T cells. Thus, we next assessed the effects of IL-10 deficiency upon these T cell phenotypes, using the mice from both cohorts that had also been analyzed for kidney disease. First, spleen and cervical LN from each mouse were weighed at time of sacrifice at 17 wk, and total cell numbers counted with cell composition were analyzed by flow cytometry. Both IL-10−/− (n = 10) and IL-10+/− (n = 22) MRL-Faslpr mice had higher spleen and LN weights compared with their IL-10+/+ (n = 11) counterparts (Fig. 5⇓A; p < 0.01 for spleen and LN weights from IL-10−/− vs IL-10+/+ mice, and p < 0.05 for weights from IL-10+/− vs IL-10+/+ animals). By contrast, there was no significant difference in weights between the IL-10−/− and IL-10+/− groups (p > 0.05). Notably, cell numbers per gram of lymphoid organ were not different among the three groups (data not shown). IL-10 deficiency increases lymphadenopathy in MRL-Faslpr mice. A, When mice were sacrificed at age 17 wk, the spleen and cervical LN were weighed. Bars represent mean organ weights. IL-10−/− and IL-10+/− animals had significantly larger spleens and LN than IL-10+/+ animals (∗∗, p < 0.01; ∗∗∗, p < 0.05). B, Phenotypes of cells of spleens and cervical LN were analyzed using four-color FACS analysis, and percentages of CD3+B220+ and CD3+B220− cells from spleen are shown. IL-10−/− had significantly fewer double negative CD3+B220+ and significantly more conventional CD3+B220− T cells than IL-10+/− and IL-10+/+ animals (∗∗, p < 0.01). C, After gating on CD3+B220− cells, the percentages of CD4+ and CD8+ T cells from spleen are shown. Upon further analysis of lymphoid organ cellular composition, the number of conventional CD3+ (CD4+ and CD8+) B220− αβ T cells from spleen was significantly higher in IL-10−/− (n = 10) mice than that in IL-10+/− (n = 22) or IL-10+/+ (n = 11) controls (Fig. 5⇑B, lower panel, p < 0.01, comparing phenotypes in IL-10−/− vs IL-10+/− or IL-10+/+ animals). This increase was mirrored by an apparently compensatory decrease in the typical double negative TCRαβ+CD3+CD4−CD8−B220+ T cells that accumulate in MRL-Faslpr mice (Fig. 5⇑B, upper panel, p < 0.01). Given that the average cell numbers per gram of spleen (∼500 × 106) were not different among three groups, we calculated the mean number of conventional CD3+B220− T cells as 210 × 106, 125 × 106, and 100 × 106 for IL-10−/−, IL-10+/−, and IL-10+/+ animals, respectively. By contrast, the mean number of double negative CD3+B220+ cells was 30 × 106, 60 × 106, and 45 × 106 for IL-10−/−, IL-10+/−, and IL-10+/+ animals, respectively. However, the percentages of conventional CD4+B220− and CD8+B220− T cells, of the total CD3+ cells (Fig. 5⇑C), as well as CD3−B220+ traditional B cells (data not shown), were not statistically different among the three groups, indicating expansion of both lineages of αβ T cells in IL-10-deficient mice. Cellular composition of LN from IL-10−/− mice revealed a similar pattern to that from spleen, with increased numbers of conventional T cells and decreased CD4−CD8−B220+ double negative T cells (data not shown). Thus, IL-10 deficiency apparently leads to expansion of both conventional CD4+ and CD8+ T cells in secondary lymphoid tissues in MRL-Faslpr mice. Because CD4+ T cell responses in MRL-Faslpr mice are characterized by Th1 deviation (8, 9), with evidence that this response is pathogenic (8, 9, 10, 11, 12), and because IL-10 has been demonstrated to inhibit Th1 cytokine responses (17), we hypothesized that IL-10 may down-modulate autoantibody production and end-organ disease in lupus via inhibition of Th1 cytokine production. To test the effect of IL-10 upon the pattern of cytokine responses in MRL-Faslpr mice, cells from spleen and LN of the second cohort of 23 animals were analyzed for intracellular IFN-γ and IL-4 production as described in Materials and Methods. Both CD4+ and CD8+ T cells from wild-type MRL-Faslpr mice produced more IFN-γ than IL-4 (data not shown), consistent with previous findings (8). In IL-10−/− mice, splenic and LN CD4+ and CD8+ cells had strongly enhanced IFN-γ production: the percentage of cytokine-secreting cells in spleens and LN of IL-10−/− mice (n = 6) was 5- and 20-fold higher for CD4+ T cells and 2- and 24-fold higher for CD8+ T cells, respectively, in comparison to cells from IL-10+/+ (n = 6) and IL-10+/− (n = 11) mice (Fig. 6⇓A, p < 0.001; see representative example in Fig. 6⇓B). Moreover, the percentage of CD4+IFN-γ+ cells from spleens and LN of IL-10+/− mice was significantly greater than that from IL-10+/+ animals (Fig. 6⇓, A and B, p < 0.01), although the percentage of CD8+IFN-γ+ T cells was similar between these two groups. IL-10 down-modulates Th1 responses in MRL-Faslpr mice. A single-cell suspension of spleen and LN was activated with anti-CD3 and anti-CD28 in the presence of brefeldin A for 6 h, and intracellular cytokines were analyzed as described in detail in Materials and Methods. A, Percentages of IFN-γ-producing cells from different gated cell subsets are shown, with enhanced numbers of CD3+, CD4+, and CD8+ cells in IL-10−/− mice compared with both groups of IL-10-sufficient animals (∗, p < 0.001) and enhanced numbers of CD3+ and CD4+ cells in IL-10+/− mice compared with IL-10+/+ controls (∗∗, p < 0.01). B, Representative example of IFN-γ and IL-4 staining of gated CD4+ T cells from the three groups of MRL-Faslpr mice. By contrast, IL-4 levels were significantly lower in IL-10−/− mice in comparison to IL-10+/+ and IL-10+/− mice (Fig. 6⇑B). It is unclear at present whether IL-10 has a direct effect on IL-4 production in this model or an indirect effect via enhancement of IFN-γ production. MRL mice develop autoantibodies and immune complex renal injury, disease features that closely resemble those found in human SLE (1). The pathogenesis of lupus in MRL and other murine models of disease (8, 9, 10, 12, 13), as well as human SLE, have been strongly associated with a predominant Th1 response (6, 7). As a regulatory cytokine, IL-10 has been shown to inhibit Th1 responses in several models of autoimmune diseases, such as experimental autoimmune encephalomyelitis and diabetes (32, 33). However, the role of IL-10 in the pathogenesis of lupus remains controversial. The abnormally elevated amounts of IL-10 detected in serum of patients with SLE (19, 20) and the recent observation that anti-IL-10 therapy can down-modulate disease in such patients (23) suggest that this cytokine may promote disease. To elucidate more precisely the role of IL-10 in the pathogenesis of murine lupus, IL-10 gene-deficient (IL-10−/−) MRL-Faslpr mice were generated and their phenotype was analyzed in comparison to IL-10+/− and IL-10+/+ littermates from the same colony. Backcrosses to the MRL background were done for 10 generations, so that MRL background genes were >99.91%. The most striking finding from this experiment was that deletion of IL-10 resulted in an exacerbated disease phenotype, with increased mortality (Fig. 1⇑), more severe renal disease (Fig. 2⇑), and skin lesions (Fig. 3⇑), and augmented autoantibody production early in the disease course, particularly potentially pathogenic IgG2a anti-dsDNA Abs (Fig. 4⇑). However, we did not notice significant differences in disease penetrance between female and male mice in our two cohorts. What is the linkage between IL-10 deficiency and the severe lupus phenotype? The logical explanation resulting from our studies is that IL-10 suppressed murine lupus through inhibition of pathogenic IFN-γ production (Fig. 6⇑), especially at the early stages of disease development. Studies using both IFN-γ- and IFN-γR-deficient lupus-prone mice have revealed a pathogenic role for IFN-γ in lupus, especially in its initiation (9, 10, 12, 13). However, IFN-γ seems not to be required for later stages of disease, a notion supported by the failure of anti-IFN-γ Ab administration to ameliorate disease in 12-wk-old MRL-Faslpr mice (34). Our results are consistent with such a notion. 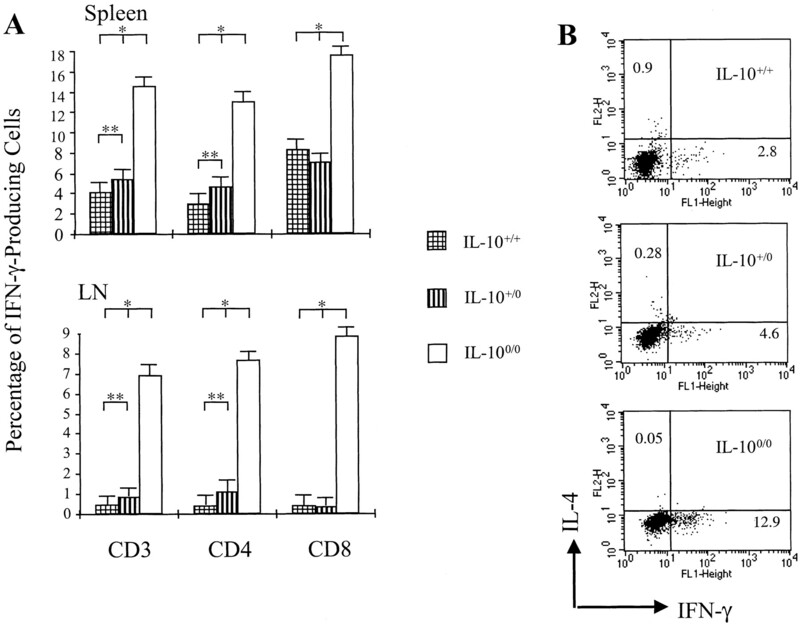 IL-10 deficiency enhanced IFN-γ production in the CD4 and CD8 lineages (Fig. 6⇑), and that, in turn, was associated with increased production of IgG2a anti-dsDNA Abs, an IFN-γ-related pathogenic isotype (Fig. 4⇑). Notably, the effect on autoantibody production was only significantly different in IL-10-deficient animals at early time points (9–10 wk of age), but not at later stages of disease. 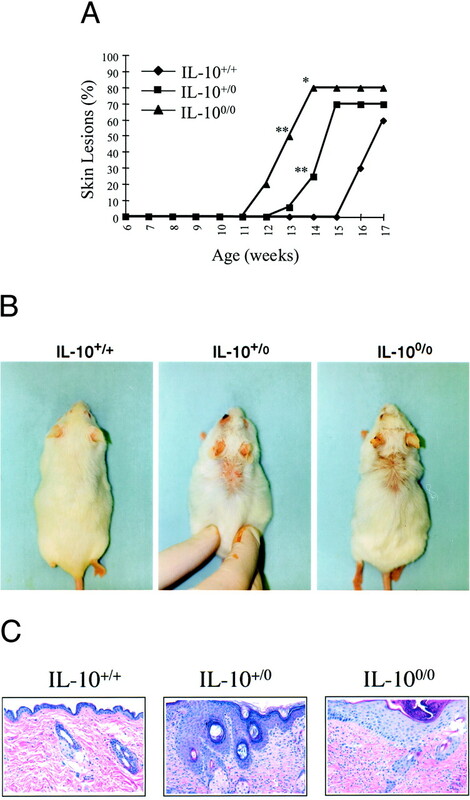 The early development of skin lesions and increased early mortality further support the role of IL-10 in suppressing murine lupus at an early stage, presumably effects mediated in part through inhibition of IFN-γ production. Administration of rIL-10 reduced IgG2a anti-dsDNA Ab production, again early in disease, supporting the role of a specific effect of IL-10 in disease amelioration. We would add that IL-10 deficiency only exacerbated lupus phenotypes in the MRL background that contains the genes necessary for full disease penetrance, because there was no apparent consequence of its loss in Fas deficiency in the B6 background, with B6-Faslpr IL-10−/− mice lacking features of lupus end-organ disease. The finding that MRL-Faslpr IL-10+/− mice had a more severe phenotype than MRL-Faslpr IL-10+/+ mice, in terms of kidney pathology, skin lesions, and lymphadenopathy, also intrigued us, suggesting that the number of competent alleles may determine IL-10 expression level in vivo. To our knowledge, a clinical effect of heterozygosity at the IL-10 locus has not been previously reported, raising the possibility that the phenotypes seen in our IL-10+/− mice, in comparison to IL-10+/+ controls, became manifest only under the conditions imposed by the disease-promoting genes in the MRL-Faslpr background. This issue is the subject of ongoing studies. Notably, we did not observe the development of clinical enterocolitis in our MRL-Faslpr IL-10−/− colony that has been previously reported in intrinsically nonautoimmune IL-10-deficient mice (35). This observation deserves further study to determine the role, if any, of the MRL background genes and/or Fas deficiency in protection against the enterocolitis of IL-10 deficiency. How can the conflicts between our results and the current notion that IL-10 has a disease-promoting effect in animal models and patients with lupus be reconciled? For instance, earlier work using continuous administration of anti-IL-10 demonstrated a delay in onset of autoimmunity in NZB/W F1 mice (22). In a more recent report, anti-IL-10 mAb administered to six steroid-dependent patients with SLE was shown to have a beneficial effect on disease activity (23). These studies, combined with the observations that levels of IL-10 in serum are characteristically elevated in patients with active lupus compared with controls (19, 20, 21), suggest that this cytokine may promote disease. Yet, IL-10 can be secreted by many cell types, with multiple biological effects (17). For example, IL-10 can inhibit IFN-γ production and inflammatory responses (36) as well as promote B cell proliferation and Ab production (19). Accordingly, IL-10 may have multiple effects in lupus depending on the stage of the disease. For example, IFN-γ and pathogenic autoantibody isotypes (e.g., IgG2a) are necessary for full disease penetrance (9, 11, 12, 13), and blocking Th1 cytokine responses may down-modulate lupus when applied in the setting of early, perhaps preclinical, disease. Our results using gene-deficient mice to remove endogenous IL-10 clearly exacerbated disease, particularly in young mice, an effect mirrored with IL-10 administration, supporting the hypothesis that IL-10 plays a down-regulatory role at an early stage of development of lupus. Therefore, one has to consider the dual effects of IL-10 for clinical application of either IL-10 or anti-IL-10 to treat lupus patients. As a parallel, IL-12 has also been demonstrated to have dual effects in collagen-induced arthritis, with a stimulatory role in early arthritis expression and a suppressive role in the established phase of disease (37). Further support for the regulatory role of IL-10 in lupus comes from the finding that this cytokine promotes activation-induced death of T cells from patients with SLE, a process mediated by Fas ligand (38). Notably, our MRL-Faslpr mice that were IL-10 deficient had expansion of conventional CD3+CD4+B220− and CD3+CD8+B220− T cells, also suggesting a regulatory role of this cytokine in controlling the number of conventional T cells, including those that promote autoantibody production and renal disease. Indeed, recent studies with B cell-deficient or autoantibody-deficient MRL-Faslpr mice (39, 40) have suggested that disease can occur in the absence of B cells and autoantibodies; i.e., T cells presumably can promote disease independently of B cell help. However, the finding that MRL-Faslpr IL-10−/− mice had T cell expansion suggests that IL-10 can regulate T cell expansion apart from Fas-Fas ligand interactions. Further studies are needed to determine the mechanisms of such T cell expansion, including the role of IL-10 in controlling the CD4−CD8−B220+ T cells that characteristically predominate in cytokine-intact lpr mice. Our results suggest the following roles for IL-10 in murine lupus, and perhaps in patients with SLE: during the initial phases of disease, IFN-γ and its induced IgG2a promote autoimmunity. IL-10 appears to be needed to suppress such pathogenic Th1 responses, including IFN-γ-mediated autoantibody production and renal inflammation. By contrast, at later phases of disease, excessive amounts of IL-10 production may lead to enhanced autoantibody production and subsequent formation of pathogenic autoantibody-Ag complexes. Therefore, anti-IL-10 Ab plus immunosuppression may have a beneficial effect on disease outcome when supplied later in disease. Further studies are needed to test this assumption by using staged IL-10 therapy in murine models of disease. In conclusion, we demonstrate that IL-10 plays a critical role in down-modulating murine lupus through inhibition of IFN-γ production. These results have significant implications for the pathogenesis and treatment of human SLE. We thank Philip Kong for reading the manuscript and helpful discussions, and we thank Christie Hawley for animal care. We are grateful to the Schering-Plough Research Institute for provision of rIL-10. ↵1 This work was supported in part by National Institutes of Health Grants AR40072 and AR44076, by the Arthritis Foundation and the Lupus Foundation of America and their Connecticut chapters, by the S.L.E. Foundation by a Kirkland Scholar’s Award (to J.C.), and by a Yale Skin Disease Research Center Pilot and Feasibility grant (Dr. Robert Tigelaar, principal investigator). Z.Y. is the recipient of an Arthritis Foundation Investigator Award, a Hull Cancer Research Award from the Yale Comprehensive Cancer Center, and National Institutes of Health-National Institute of Arthritis and Musculoskeletal and Skin Diseases Grant K01 AR 02188. ↵3 Abbreviations used in this paper: SLE, systemic lupus erythematosus; LN, lymph node.